I arrive before 4 pm in the castle of Yquem. For the last two days the bottles were standing on a table in the circular room of one of the towers. A photograph will take pictures of the whole event. 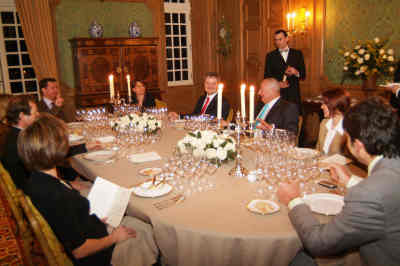 Christiane prepares the table, and 12 glasses are strictly arranged in front of every seat. Nice white flowers are presented in every possible place. All is nice. The whole place smells wax as every room had been cleaned and waxed. I ask that every window would be opened to rub this awful smell. I open the bottles, and Sandrine Garbay, whose husband had an operation in a clinic, was not there, but Valerie Lailheugue looked with a great attention to my operations. Every smell is very classical. The smell of the Carbonnieux 1928 is so generous that I decide to close it with a neutral cork. The Corton 1929 is a little disturbing but will be cured by the air. The Chateau Chalon 1955 instead of having a smell of nuts has a smell of truffle. We will see. The castle has still one 1861, but which was recorked. My bottle is original, and Sandrine Garbay, responsible of the cellar and of the wine making, had already confirmed that it is an original cork and confirmed again when she came later. So, for me, to open a liquid which had stayed in the same bottle for 145 years minus 3 of barrels is incredibly serious. I put away a capsule of golden colour but which has some black stains. I try to clean the top of the bottle, and some pieces of glass fall. I separate some tiny pieces of glass. Why does the glass break so easily ? And I begin to panic. I ask for a hair dryer to put away any piece of glass, the wine being protected by the cork still inside. And I begin to pull the cork. It breaks as a flower which would lose its petals. I use a special corkscrew which allows me to feel what happens, and I succeed in pulling every piece outside the bottle with nothing falling in the wine. I smell. And “wow”. Imagine the actor who listens that he has received the Oscar award for the best actor. This smell gave the same message to me. Perfect. The colour had made me fear that it would be caramelised. It was not! Less that the Yquem 1950 that I had four days ago. Fantastic. If Valerie had not been there, I would have danced alone in the room. I drank a sip and shared a drop with Valerie. Once again fantastic. I was so happy. As if my heavy weight had become a feather weight. Wow. The rest of the day would be relaxed. And in our mouth, the taste of the Yquem never ended. Sandrine Garbay arrived, and I had kept the empty glass. The perfume that came from the glass had the real perfection of Yquem. I had such a joy. Sandrine seeing my excitement took a Yquem 1957 that was recently opened, and gave me one glass. A pure Yquem with no extravaganza, whose length was shortened by a few days of opening. But a delight. And I was happy. I talked with the people who would serve the wines, I arranged every bottle for a proper temperature and position, and when I was sure that everything would be proper, I went to take a shower in a room of the castle. Under my shower, it was as if I were the king of the universe. I wait for the guests in the office of Pierre Lurton, who is always between two trips, chatting with him. The guests arrive, and we visit the chais, and we taste the Yquem 2001. This Yquem is immense. It is the definition of the perfection of Yquem. What a personality. It has already changed since the last time I drank it. The taste of grapes has evolved towards darker grapes. I love this wine. We go to the castle. We are nine. Four couples and myself. We drink a Dom Pérignon 1985 which was designed to clear the mouth from the invading persistent charm of Yquem 2001. It is served with some cakes that I could not negotiate to avoid. These cakes shorten this elegant champagne which is a champagne of fight : it requires a complicated food to fight with it for the pleasure of our palate. Obviously a great champagne. We go to our table nicely dressed in an emotional room. The menu of the chef Marc Demund is : Œuf Poché au Corail d’Oursins / Noix de st Jacques sur Effilures d’Echalotes Confites / Homard Rôti aux Truffes / Esturgeon et Poireaux Bordelaise / Mignon de Veau à la Fleur de Lavande / Foie Gras de Canard Poêlé aux Amandes / Comté / Pavé de Mangue et Agrumes / Mignardises. I had talked a lot with Marc to make these choices. We begin with Laville Haut-Brion 1976. Already golden colour, intense nose, this wine exposes what I announce concerning the world of old wines. Magnificently balanced, the wine is enlarged by the urchin. The Chateau Carbonnieux white 1948 is an enigma. I had checked that it is an original bottling (this can be done by looking, under the capsule, the sediment), and it amazes everyone that the wine is incredibly young. The yellow colour is almost as green as for a young wine, the smell is of an infant, and the taste is brilliant because then we see that age has integrated every aspect. With the scallop, a classical combination. The lobster will welcome two wines : Pavie 1971 and Carbonnieux red 1928. My palate is used to such old wines which appear as heavy as Port wines. This Carbonnieux is truly heavy like lead, having an unbelievable concentration. I love a lot. My guests less. The length is incredible. If they do not try so much the Carbonnieux, it is because the Pavie is to adore. I will not raise any controversy, but I adore this Pavie, elegant and expressive, for my taste largely above any recent version of the same wine. And with the Audouze method, the two wines shine at their best. The combination with a lobster a little too cooked is a delight. The heavy truffled sauce taken with the Carbonnieux which smells truffles is a unique moment. Probably the best match for me. The smell of the Chambolle Musigny Bouchard Père & Fils 1967 is, after the great old Yquem the smell of the evening. Emotional, seducing. I love it. And in mouth with the sturgeon, it is fantastic. This wine is absolutely performing above its category. And the Echézeaux Domaine de la Romanée Conti 1991 is magnificent too, even if more accessible for everyone due to its age. I have loved it. I was a little afraid of a possible repulsion of the bordelaise sauce with the wines. It was a success, and it is my coquetry to have put a bordelaise sauce with two Burgundies in Chateau d’Yquem. The veal was delicious and the Corton« cuvée B » Brossault 1929 whose smell was unpleasant had gently become to the state I expected. A delicious Corton of the greatest year for Burgundies. Light colour with some pink. Smell rather short. And a fill in mouth of warm welcome, complex taste, pleasure. I have drunk better 1929, but this one was nice too. I had asked that the foie gras would come at the end, as it was made in the 19th century. The Krug 1988 was not the proper match with it. A gently light sweet wine would have been more logical. A delicious Comté not too old as I had asked made shine a Chateau Chalon Jean Bourdy 1955 which was rather light for a “vin jaune”, which was particularly good, as a stronger wine would have disturbed some of my guests, specially the women. Not knowing that the 1861 would be so good, I had planned that we would finish with the Yquem 1961 to keep a nice taste in mouth. But as it was so great, we would finish naturally with the older. Yquem 1961 is a great Yquem. It is the gift of Pierre Lurton for this dinner, with the intention to see what a century of distance will make. Directly in the historical line of Yquem, with a great power, a balanced structure, a very deep trace in mouth made by fruits like peaches, apricots. Great, and historically designed. If I want to be indelicate, I would say that it is the first time in this historical room that I have tasted such a perfect match of a dessert with a Yquem. I know that it is naughty from me. We were expecting the star : Yquem 1861. The nose is spicy, prunes, intense, and curiously, with no default. In the glass the colour is very brown, but when the wine is moved, the gold shines more. In mouth it is religious. The definition of the structure is so precise, delicate. It evokes candied prunes, or prunes burnt by the sun, or marmalade of prunes. The citrus fruit aspects are very discrete but exist to make it more charming, and the caramel, torrified aspects, are discrete too. You can think of coffee, tea, but the main image is prunes. And what is impressive is the incredible length. Normally in the castle some alcohols like Paradise Hennessy are served. Everyone did not touch any, just to keep the perfection of this rare Yquem in mouth. The atmosphere was not to make people vote. But I give my ranking : Yquem 1861, Chambolle Musigny Bouchard 1967, Carbonnieux blanc 1948 and Château Pavie 1971. The Yquem 1961 would be highly ranked in another dinner, but tonight it is in the shadow of the 1861. I could say that for a collector as I am, to present my wines in a dinner by Château d’Yquem represents what could make me think : now, I can die in peace. Many events to come should give me the motivation to continue these adventures. Cette entrée a été publiée dans dîners de wine-dinners le 9 mars 2006 par François Audouze.